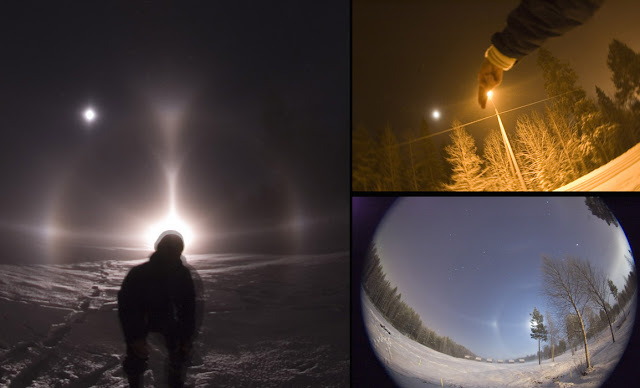 Here is some more material from the diamond dust in Rovaniemi three nights ago. After the heaviest Parry-crystal bombarding was over, Moilanen arc appeared, as shown in the photo on the left. Moon gives the beauty spot. I have crystal photos from this stage, but as usual, they give no clue to Moilanen arc. In the earlier Parry-stage there was no indication of Moilanen arc whatsoever, but I did not manage to get the crystals. This bugs, because comparing the samples might have pushed us forward in solving the mystery. The upper left image shows parhelia from streetlamp - the stripes that are parallel to the electric lines. Then there are also arcs extending slightly obliquely downwards. While visually parhelia curved towards me, these other arcs curved away and around me. As far as I understand from looking at divergent light simulations by Lars Gislen et. al, this effect is a 120° parhelion. In the photo only the brightest part of 120° parhelia is seen, visually the crystal glitter extented much further. Also a full parhelic circle was seen visually. This post is fascinating as always. What made me think now is the top right-hand photo. Trying to imagine what divergent-light halos look like in reality (and why they are like that) requires some talent in 3-dimensional visualization. Having read now the Gislén et. al. articles (many thanks, Marko! ), I started wondering if anybody has heard of any earlier documentation of the 120° parhelia produced by divergent-light. In the article "Observations and Simulations", there is a half-sentence saying that it "had probably never been seen" - at least as far as 2003 (p. 4278). I wouldn't be surprised to hear that this was the very first photo of what truly seems to be 120° parhelia based on the simulations. Marko I wish I had your weather conditions because I would not know what to do I would go halo crazy!! Ágnes, yes this might be first the first observation of 120 parhelion in divergent light. Michael, That is pretty much what is happening every time, even though I have seen some displays already. Just have to try to calm down and remember to take also those crystal samples. This time things were hampered by Nikon D70 corrupting memory cards one after another. It seems to have something to do with cold battery. After I made sure there was always warm battery in the camera, broblem disappeared. Many photos were copputed, but I got most of the recovered. Will going to 6 day ski vacation to Kuusamo in the beginning of the February..I hope that the extra weight of the JohnLite will be worth the trouble. btw...I see you are using 8mm circular fisheye on cropped sensor...I have great news to you - Sigma has announced a 4.5mm fisheye for the APS-C cameras available in January, so we can enjoy full fisheye captures without going on expensive full frame. Yes, we are aware of the Sigma fisheye. Gotta think about it. Hoping diamond dusts during the Kuusamo trip. The diffuse arcs three weeks ago were photograhed with same lamp as yours (JML2940). Hopefully they will be running the machines in February in Kuusamo. I heard here is soon enough snow and then the machines are not used anymore during the rest of the winter - unless great losses happen due to warm weather. Now the weater is turning above freezing, so possibly that gives me an extra week or so. Marko can you tell me in what temperatures these images were captured and how fast the JML2940 battery ran out it's power ? Did you used some extra power source as well ? The first display, of which I just added more photos, was in about -7° to -10°C. The next one was in -6°C and the last weekend display at -11°C. JML2940, which was used in first and second display, lasted about 40 minutes. But this is an estimate. That time I had only one battery. If you are going to buy more, don't take cheap batteries - they are lightweight and last shorter time. Marko Mikkila was visiting here the other weekend and contructed a wire that allows use of outer battery though the car plug in the lamp. Now that I have the Cyclops X-15, which is the same as JML2941, the energy consumption is even stronger because it uses 130W bulb instead of the 100W in JML2940. But this 130W bulb is no good. It creates a shadow that splits the beam. The shadow is also in the 100W bulb, but it only extends halfway though the beam. So you can position it pointing downwards. Anyway, last weekend I was still using the inner 7Ah batteries in the X-15, but I got the feeling that I was changing them all the time. Possibly they lasted max. 15 minutes out in the cold. So next day I bought 60Ah outer battery which will be tested the first chance. I've got also 100Ah battery - donated by Mikkila - but it is too heavy to move with bicycle. Thank you Marko for your in depth response. The -25 up to -30 degree February cold in Kuusamo makes me wondering is it really worth all the trouble carrying the JML2940 with the extra batteries up to north. This thing takes easily all the space in one standard 50L backbag. Marko If can you may want to get a hand warmer or a foot warmer and use that to keep the camera warm. That may sound strange but it beats no hear at all or a small propane heater. Krusel, even if you get just 10 minutes of good display in the light of JML2940, I think it is worth taking with you if only you can squeeze it in. But upon leaving call the ski center and ask whether the guns will be on. If they are not, chances for good display may be non-existent. And ask also do they have low temperature limit for operating them. Michael. Yes, I have hand warmers for that purpose. Indeed, last weekend was the first time when the lens started to frost. But I was out from 21:30 to 06:00.